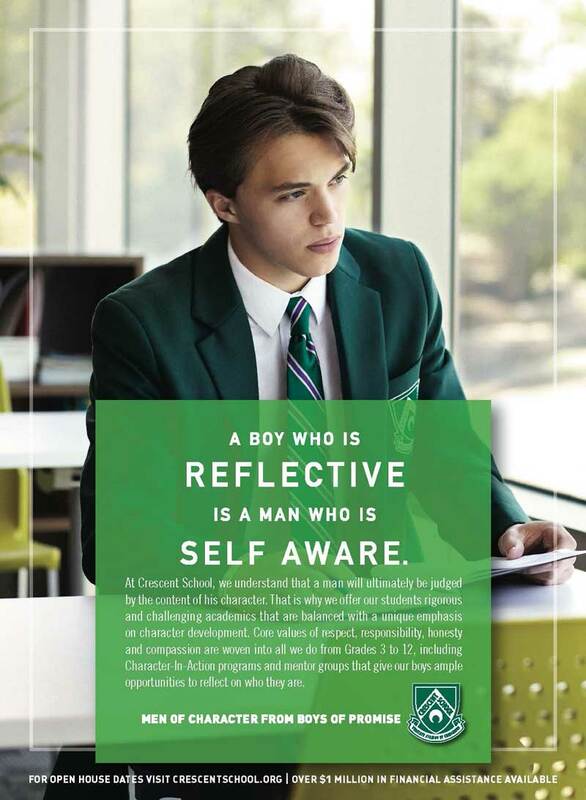 Chosen because Crescent School won Silver in the 2018 Brilliance Awards for Advertising. Crescent School’s Marketing and Communications team told InspirED the story behind this winning campaign. 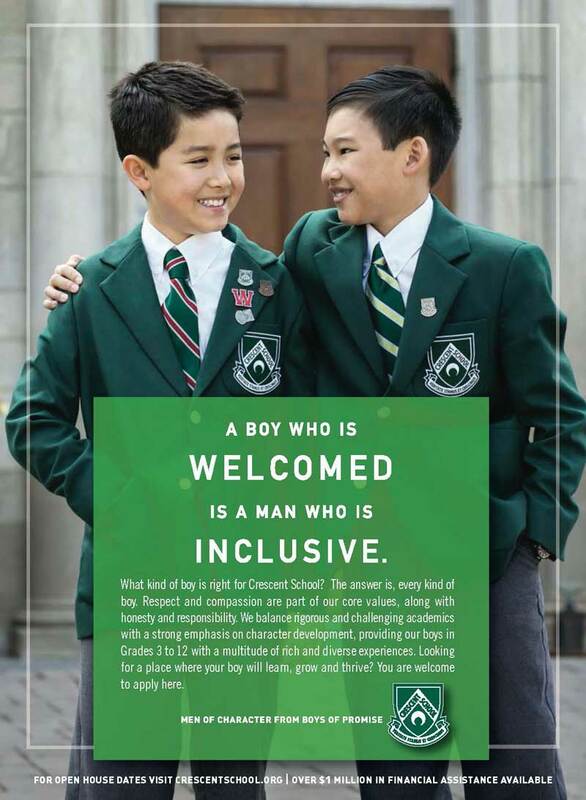 Crescent School launched an advertising campaign a few years ago that is part of a larger brand awareness effort to attract prospective families. Other goals of the campaign include establishing Crescent School’s brand positioning in the broader marketplace, highlighting their key advantages, and reinforcing their value proposition for current families and faculty. Crescent School’s research indicated that the most important driver for parents selecting a school is the development of strong character, morals and values followed closely by academic excellence and superior post-secondary opportunities. In addition, the school has a superb understanding of boys, the needs of boy learners, and the development of character in boys supported by their four core values of respect, responsibility, honesty and compassion. Knowing all this, Crescent’s messaging leads with character to align with prospective parents’ needs. Crescent has been running the “A boy who… is a man who” campaign since Fall 2015. Each year, they refresh the campaign to feature different student ambassadors and different copy lines. The annual production schedule follows. August: Ad materials sent to media and marketing channels including newspapers, consumer magazines, publications focused on private schools, bus boards, and direct mail, as well as signage around campus and school website. Crescent uses an agency of record, Sparkplug, to develop brand advertising and other critical marketing material. “There are several benefits of using our creative partners in this process,” says Lynda Torneck, Crescent School’s Director of Marketing and Communications. “First, the agency brings a unique talent in message distillation and crafting. Second, they are experts in graphic design and ad production, ensuring their ads retain the highest quality across all media (e.g. a quarter-page newspaper ad and a 12-foot bus board). Finally, by outsourcing this project, the Marketing & Communications Department can focus on other important school events and communication requirements that take place during the very busy spring term.” Crescent’s advertising budget, including photography, is approximately Cdn $40,000.00 (US $30,000.00). This covers concept development and ad material production but excludes the media buys. Congratulations on your win, Crescent School. You are brilliant!